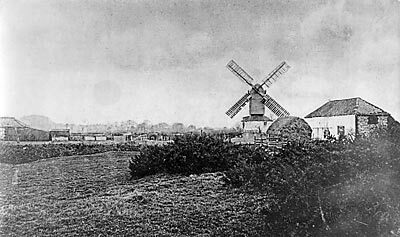 East Rudham postmill stood to the southwest of the village on the Common within a few hundred yards of the source of the River Wensum. The mill had a two storey roundhouse that stood on an 8 foot mound, the roundhouse having a loading door just under the eaves. The mill was powered by and four double shuttered patent sails, each with 5 bays of 3 shutters and 1 bay of 4 shutters on the outer side. The sails ran 2 pairs of French burr stones, a flour mill and jumper. A gallery was set around the eaves of the buck. A bakehouse was also run from the mill site and by 1896 wind power was being supplemented by steam power. The above photo was taken by the Frenchman H. Corbierre. 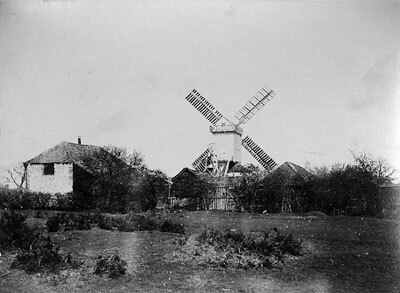 A most desirable Situation for the above Trades consisting of a capital POST-WINDMILL (almost new) with roundhouse under it, capable of containing from 15 to 20 lasts of wheat, now in full trade with two pairs of French stones, flour mill with jumper for cleaning offals and all other going gears complete. Also a substantial and convenient brick tiled Dwelling house with large baking office attached and granary over it forty feet long by sixteen wide, cart lodge and piggeries together with a large garden well planted, yard and pightle together containing about one acre. The above premises are all freehold and in most excellent repair and are situated at East Rudham in the county of Norfolk, a good corn country near the markets of Lynn, Fakenham and Wells and possess an unlimited right over the valuable and extensive common of East Rudham aforesaid. Apply (if by letter post paid) to Mr. John Raven, the proprietor on the premises. 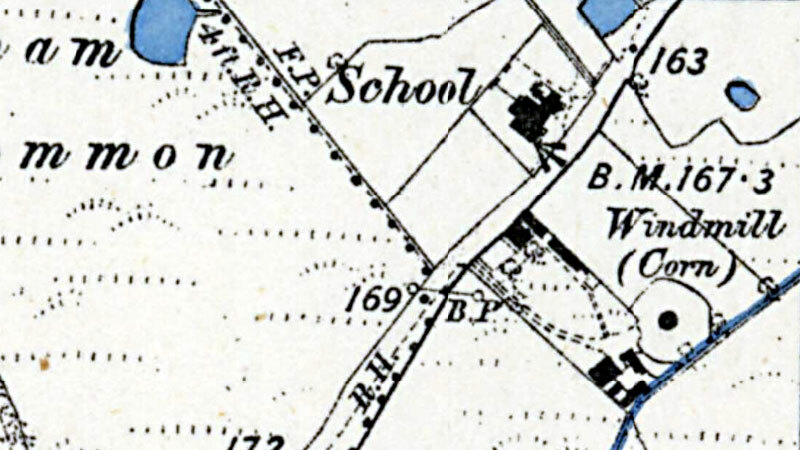 Robert Kerrison was recorded as journeyman miller in the 1851 census, was the nephew of Adam Kerrison, the owner of Lt_Snoring_open_trestle_postmill. In the 1841 census Robert Kerrison was working as a baker in Gt Snoring. WANTED, a steady man as Miller; one that can do Baking occasionally if required. Apply to John Frost, East Rudham Mills, Swaffham. Apply to Mr. John Frost, East Rudham, the owner & occupier or to Coulton & Son, Solrs. Lynn. . Wanted, a trustworthy steady man to work a wind mill and drive an engine occasionally; good references required. Also a steady honest man as Journeyman Baker; one used to a country trade preferred. Apply to John Frost, Rudham Mills, Swaffham. Baking & Milling Business. In-door Apprentice wanted at once. Apply to G. H. King, East Rudham Mills, Swaffham. Man wanted as a Miller & Baker. Apply to G. King, East Rudham Mills, Swaffham. The above photo was taken by Gordon Ackborn. DAMAGE BY LIGHTNING. During the thunderstorm of 24th June Rudham Mill was struck by lightning, one sail being damaged and a window broken. Fortunately no one was near the mill at the time, so that no further harm was done. The foundations of the roundhouse and the four piers on their artificial mound recorded as about 8 feet high in the 1970s, had all been removed by 1980. The mill site was then in a ploughed field to the rear of the mill house.